After watching from the stands as Canada tied Scotland 1-1 midweek, new coach Octavio Zambrano will be on the sidelines Saturday for a Canadian under-23 team game against Uzbekistan in Doha, Qatar. 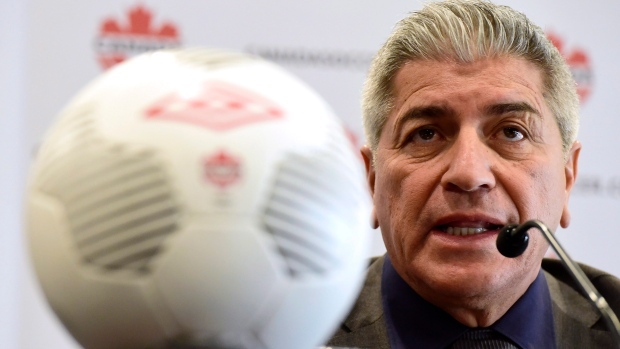 In appointing Zambrano as head coach of the Canadian national men's national team program earlier this month, the Canadian Soccer Association said the 59-year-old from Ecuador will serve as the one voice for the men's side of the program. Zambrano will run the senior side but also hold sway over the age-group squads. Michael Findlay, who has served as interim head coach of the senior side since last September including the tie in Scotland, is also in Qatar as Zambrano's assistant. It's a new approach for the Canadian under-23 team, who play the tournament hosts on Tuesday at the three-team tournament. In the past, the Canadian Soccer Association usually only revived the squad when it came round to Olympic qualification. The goal now is to have a more active under-23 team, giving players in that age group a chance to play internationally outside the senior squad. While there are two 19-year-olds on the 18-man roster for the Qatar tournament, 12 of the players are 22 or 23. "Octavio's excited about the fact that he's getting to see that next group of players who may not get a chance generally and some that are not currently playing minutes or at least in first-team environments in the MLS mostly," Findlay said from Doha. The CSA sees it a way to mine talent "for additional players to extend our long list and create those internal competition moments," said Findlay. The squad includes Toronto FC's Jordan Hamilton, Montreal Impact's Maxime Crepeau, New York City FC rookie Kwame Awuah and Michael Petrasso of Queens Park Rangers. Most of the team arrived in Qatar on Wednesday. The Edinburgh contingent arrived early Friday morning. Goalkeepers: Maxime Crepeau, Montreal Impact; Marco Carducci, unattached. Defenders: Kadin Chung, Vancouver Whitecaps FC 2; Amer Didic, Swope Park Rangers; Marko Aleksic, FC Edmonton; Kosovar Sadiki, Stoke City U-23. Midfielders: Jordan Schweitzer, Orlando City B; Manuel Aparicio, SD Ordes (Spain); Juan Cordova, CD Union San Felipe (Chile); Caniggia Elva, Stuttgart II; Louis Beland-Goyette, Montreal Impact; Patryk Misik, SD Ordes (Spain); Mark-Anthony Kaye, Louisville City FC; Kwame Awuah, New York City FC. Forwards: Jordan Hamilton, Toronto FC; Michael Petrasso, Queens Park Rangers (England); Keven Aleman, CD Saprissa (Costa Rica); Mark Gonzalez, Swope Park Rangers.